On the day of departure, our guide will pick you up from the airport or your hotel and drive you to the Infiniti where after a brief welcome and safety briefing you will be assigned cabins. The cruise director will schedule up to 4 dives a day, 3-day dives and an evening or night dive. The day before return, we will schedule only 2 dives so you have 24 hours before your flight back. This trip is very diverse. It includes Apo Reef which is the largest reef in the Philippines. Coron which is famous for the WW2 Japanese wrecks and El Nido known for its beautiful beaches and landscapes. South Corner Depth: 25ft – 200+ft. Large schools of Red tooth triggerfish and Pyramid butterfly fish can be seen on the edge of the reef. Down deeper you can see Square Spot anthias and Regal Angel fish. Look out for Hawksbill turtles feeding on sponges, Lobsters can be found in crevices in the shallows. There is a large resident Napoleon Wrasse that can be seen around the mooring line. Ego Wall There are schools of Midnight snapper and unicorn fish. Giant Trevally can be seen in large numbers feeding on the schools of Fusiliers near the surface. In the hard coral gardens expect to see the scrawled file fish, false anemone fish and Blue fin jacks. Mabuti Wall Expect to see large moray eels along the wall, some with mouths wide open being cleaned by wrasse. There are some overhangs where you can discover White tip sharks. Some of the common reef fish you can see include Moorish idols, Porcupine fish and the Peacock grouper. Shark Ridge Look out for the Bridled Angel fish and Long Nose Hawk fish around the fans. There are some healthy Stag Horn coral gardens which are home to schools of Damsel fish. Numerous chances to see White Tip sharks along the wall, there are sightings of large schools of Jacks and Tuna off in the blue. Ranger The shallows are a large sand area where you can see the Blue Spotted stingray, look close to the surface and you can see juvenile common squid. The sheer wall drops down to a sandy bottom at around 120ft. There are a couple of cuts in the wall. You can see large moray eels hiding in a few places. There are many pairs Fire gobies that live in small burrows in the sand. North Wall The fish activity is of the highest quality and you can see a whole food chain right before your eyes. You can see Grey Reef sharks up to seven feet in length, white tips sharks hunting in packs in the edge of the reef. If your luck is in then you might see a hammer head at this site. Large Dog tooth tuna along with Giant trevally’s are in the higher water columns waiting for a chance to strike at a fish. Other highlights include schools of Jacks, Bump head parrotfish and Hawksbill turtles. Shark Airport This is where you can see all of the White tips resting on the sand. Expect to see between 10 and 15 sharks on a good day. The second part of the wall then drops down to infinity. Look out for Eagle rays in the deep. There are also some nice schools of Blue Stripped snappers on the reef edge. During the early months of the year look out for mating pairs of cuttlefish. Apo 29 You can expect to see a large school of Barracuda and the shark life can be exciting when the current is right. Not so much to see coral and macro wise and remember to watch your air and deco time on this advanced dive. Hunters Rock This pinnacle is famous for mating Sea snakes. With any isolated sea mount it is very good for pelagic species and of course sharks are a plenty. Check your tide charts and moon phases before you decide to go there and of course check the current before you dive. Corde Point Expect to see multiple reef sharks. You can see Common Lionfish, schools of two spot snappers and Unicorn fish. The wall drops down very deep. Keep a look out in the blue, you can sometimes see a large school of Great Barracuda here. Apo Wreck You can see some nice macro subjects on the wreck. The rest of the reef is made up of large coral gardens and sand patches. Juvenile Napoleon wrasse, Titan trigger fish and schools of Surgeon fish are some of the marine that can be seen. The Tangat wreck sits upright at around 30m depth with the still intact masts disappearing into the blue above. Drop down into the cargo hold through large schools of banana fish, past some enormous puffer fish and swim the length of the ship through a series of relatively open rooms with a couple of tight swim-throughs which are a good practice for the harder ships to come. Emerging near the bow, catch sight of large sea turtles, then doubled back and came to rest right near the tip of the bow. Beautiful. This was either a gunboat or a submarine hunter. Lying in 11m of water on the east side of Lusong Island, the stern actually breaks the surface at low tide. As a result, it is a great site for snorkeling and photography and there is a good variety of hard corals and marine life. All that remains of this 25m steel-hulled boat are the keel, ribs and stringers. She came aground only some dozen meters from the Northwest corner of Coron Island. As the wreck only lies in 5-22m of water, it is a great shallow dive and suitable for snorkeling. You can gain access from the starboard side and swim though the boat out over the reef. This was a Japanese freighter carrying construction materials for the building of a runway in the Pacific. 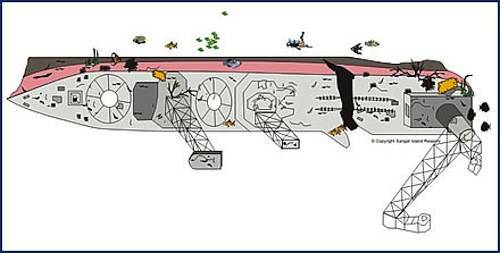 She is 158m long, displaces 6,353 tons and situated to the north of Irako Wreck, just off Tangat Island. 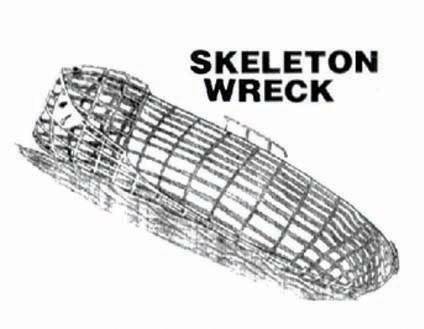 The vessel is pretty much intact and as most swim throughs are large, it is a good first wreck dive for beginners. Care, as always, should be taken though. Lying on her starboard side in 38m of water, access is possible to all six holds, the engine room and the bridge. The second hold is a real treasure trove. Cement bags are evident and you'll come across a bulldozer, tractor and air compressor, all of which are intact and encrusted. As you come out of the hold, you can swim the height of the front mast, now horizontal and reach the crow's nest at the top. Swim back over the deck to the engine room and bridge above it. Access is easiest from the stern side. The engine room is enormous and there's plenty to see. If your air allows, continue below deck to the stern and you'll discover all the deck equipment for moving cargo and working the ship. Marine life includes giant pufferfish, waspfish and barracuda. Soft and hard corals are everywhere as are sponges. This vessel was a Japanese army cargo ship. She is 120m long and lies on her starboard side in 25m of water. The wreck is situated just south of Busuanga and west of Tangat Island. The wreck is intact and penetration is easy at the cargo holds. Swim throughs to the bridge are not too demanding. A hole in the side can bring you out again. The ease of access makes this an ideal site to discover wreck diving. The superstructure is covered with soft corals and bushes of black corals. There is a good variety of fish life with shoals of bananafish, giant batfish and giant pufferfish. Be careful of the scorpionfish - they're everywhere. This was the only warship sunk in Coron Bay. She was a 118m long Japanese sea plane tender. The planes (Kawanishi) would be lowered to the sea by crane and take off from there. She is situated just northwest of Manglet Island. Remarkably, she is fairly intact bearing in mind that she took a direct hit towards the stern where the flying boat was kept and sank immediately. She was almost torn in two and the flying boat was never found. Only some of the metal on the starboard side and bottom prevented the ship from breaking apart. In fact, the bottom - the keel - is a good place to enter the wreck. Once you negotiate the twisted metal, you will see the gun placements in front of you. Other gun placements can be found outside the wreck by following the radio mast. They are at the bottom, pointing downwards.The crane used for lifting the flying boats is still intact and lies on a sandy bottom. Because of the depth and amount of twisted metal around, no swim throughs are allowed unless proper certification is shown - namely wreck diver credentials. For those of you able to proceed, you'll be rewarded by an impressive penetration to the engine room, where all four engines are intact. Further to the stern, you can find the gears and machinery for operating the crane. The wreck attracts a good amount of marine life. You can expect to see shoals of barracuda, tuna, yellowfish, grouper, snapper, batfish and a huge assortment of smaller reef fish. 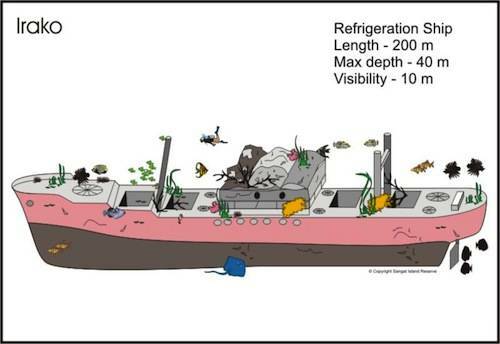 This vessel was a refrigeration ship, about 147m long and displacing 9,570 tons. 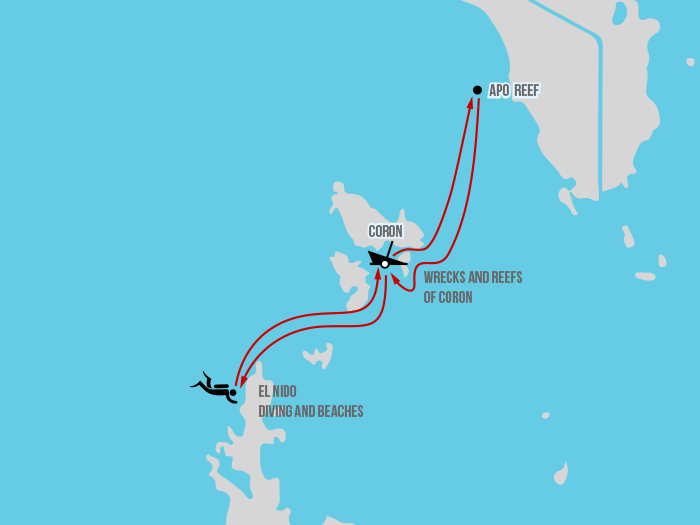 It is the most southerly of the wrecks normally visited by divers and is located at the mouth of Coron Bay. It's an impressive challenge and as visibility is probably the best of any wreck in the area, it is the most popular with trained divers. Generally, the wreck is fairly intact and it's possible to enter it towards the back where the wheelhouse is. The steering wheel is still visible. 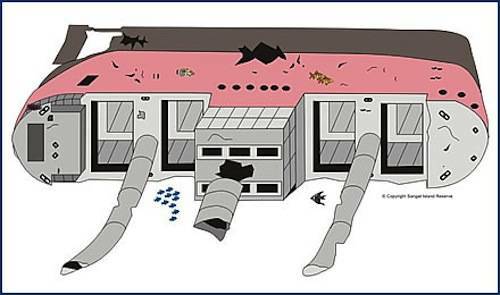 From there you can swim through to the cargo holds. Probably the best part to explore is the underneath of the superstructure. It is possible to go down into a cargo hold at 36m and swim throught to the galley. There are still pots, pans and wiring to be seen. From here, you swim out through a stairway amidships. It's also possible to reach the galley through a rent next to the rudder at 40m. There is a lot of silt here and visibility can get bad if you fin too hard. Entering from this direction, there is no immediate way out. You have to go back the way you came or continue on for some distance. Marine life is varied and you can expect to see big groupers, schools of tuna and yellow fin, lionfish and scorpionfish. If you're lucky, you may come across a turtle. It should be noted that this is a deep wreck dive and should only be undertaken by experienced, trained and properly equipped divers. 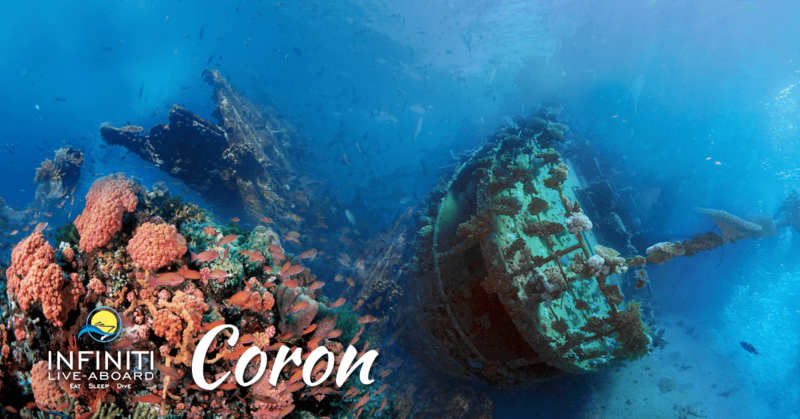 The Okikawa Maru is a leviatan tanker that lies upright in 26m of water and by length, width and volume is the largest of the Coron wrecks and an hour long dive is possible. The bow area of the ship was hit and it is now bent and twisted into incredible shapes. A true reminder of wartime. The deck is between 10-16m and is ideal for beginners. For more advanced wreck divers there are a number of areas where penetration is possible. Through the propeller shaft and on up to the engine room is the best. 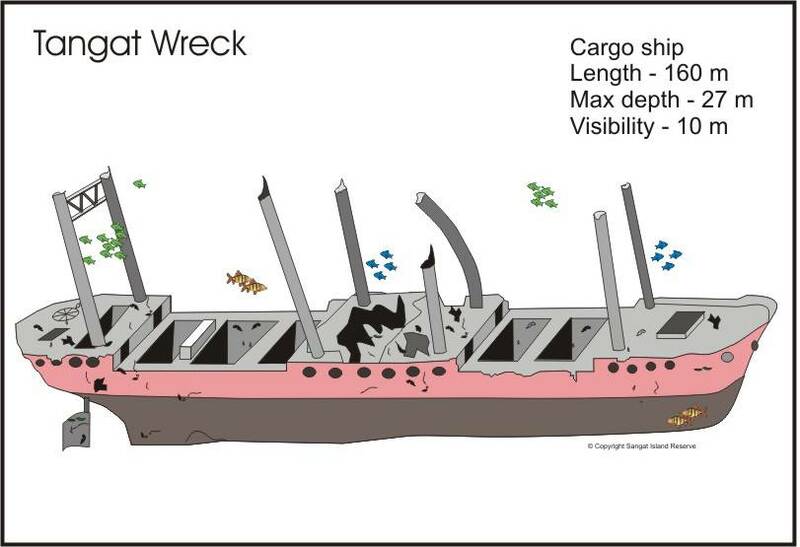 The front portion of the ship is also accessible, starting at a cargo hold on top and coming out of the twisted wreckage at the front. This is a spectacular swim through. Miniloc Island offers four sites, Tagbao Island, Biet Point, Twin Rocks and The Wall, all of which are relatively calm and sheltered year-round. Both sides are good training grounds for novice divers and can also be appreciated by experienced snorkelers. South Miniloc known as Biet Point, is the most popular dive site in El Nido located in the south-east tip of Miniloc Island. This site was discovered by Jacques Cousteau in the 1970’s. The highlight of South Miniloc is a beautiful area of cabbage corals inhabited by big school yellow snappers and silver tunas. Divers may also encounter jacks, barracudas, squids, cuttlefish, and angelfish. South Miniloc is a reef at a depth of 12 meters with a triangular shape, facing Simizu Island and separated by a channel. It’s a challenging dive due to the strong current between the 2 islands. Tagbao island is located off the northwest point of Miniloc Island. This small island is also known to many as “Tres Marias” in reference to three important reefs nestled between Tagbao and Miniloc. This place is suitable for beginner level divers since it’s a shallow site. Divers can expect to see a lot of reef fish, corals, and bountiful crayfish. Twin Rocks is a site that slopes 13 to 21 meters similar to Biet Point and has a sandy bottom. It is found on the north side of Miniloc Island. It is characterized by corals, sea whips, and sponges. Divers may encounter stingrays and schools of angelfish here. Dilumacad Island or Helicopter Island as the island looks like a helicopter when approaching from El Nido has multiple dive sites and it’s best known for its cave dive. The entrance of the caves is situated at 12 meters depth and the tunnel is about 35 meters long. This spectacular dive site is for advanced divers only. The sandy bottom of the cave is home to small fishes and crabs, while the rocky area near to the exit is inhabited by large fish such as Spanish mackerel and jacks. Matinloc Island is quite similar to the Miniloc island when it comes to diving sites, it has various diving sites surrounding it that offer many different kinds of fishes that serve as eye candies for diving enthusiasts. Banayan Point, situated in the southern tip of Matinloc Island is a great site to see pelagics. The strong currents in this area can bring tuna, jacks, and mackerels. Another highlight of this dive sites is the eye-catching coral encrusted rocks. Bikanayos Rock is a diving site that is also known as Picanayas and is found on the western side of the Matinloc Island. It has various large boulders around it. Whitetip sharks are frequently spotted in this site while Pelagics can also be seen here often. Inbogal Point is found just to the southwest of Bikanayos. It has some impressive gorgonians and green corals on a 35 meters slope. It is home to a unique species of angelfish named Pomacanthus annulariswhich can only be found at Inbogal Point and in Tres Marias; and is a common sighting spot for tuna, jacks, and mackerels. A steep wall with some lovely green corals and impressive gorgonians, this dives main attraction is the chance to encounter some large pelagics. The Aberdeen’s Reef located in the south-east of Miniloc Island is well known to have an incredible variety of fishes and corals. Garden Eel, Butterflies, Damsels, Fusiliers, Rabbits, Wrasses, Unicorns, Angels are usually seen in this site. It’s also a good macro site with a lot of nudibranchs. Paglugaban is another limestone cliff island near Miniloc best known for macro diving as it has an incredible variety of nudibranchs. Divers may also encounter Bumphead Parrotfish, marble ray, turtle, lionfish, and grouper. North Rock A single rock which can be circumnavigated if the currents are right. This dive site is famous for its pelagic life and beautiful hard and soft corals. Nat Nat Beach, located in the southern part of Cadlao Island, it’s another dive site in El Nido. It consists of a reef with sandy patches at a maximum deep of 20 meters. This site has an incredible variety of coral, fishes and macro life. Divers can see nudibranch, eel, stonefish, anemone fish, turtle, and seahorses. There are many dive sites around Entalula Island. South Entalula has some of the most beautiful coral formations and gardens with many tropical fishes. West Entalula is a wall which goes down for about 35 meters. Divers may encounter many fishes hidden in the small caverns along the wall including clams, lionfish, octopus, frogfish, scorpionfish, and turtles.